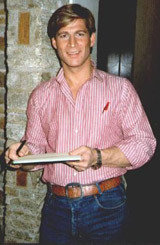 This site is about British actor, producer, director, SIMON MacCORKINDALE. It is created by Lonna Poland, who ran "Simply Simon", Simon's official international fan club for nearly 13 years. Now we offer an online version of Simon's fan club, complete with a huge variety of pictures from Simon's projects and issues of "Simon Says" the fan club newsletter. © 1998-2007 This site designed by: Lightning Web Designs & Hosting - All rights reserved.